An easy care autumn flowering bulb, Nerines are best planted from summer through to winter in a well drained sunny position in a humus rich soil. 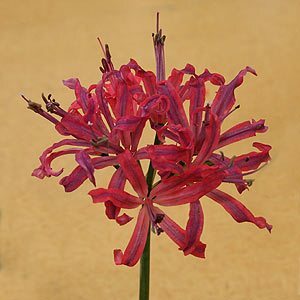 Nerines are available in a range of colours, are easy to grow, do not need to be lifted every year and are generally trouble free. Being summer dormant Nerines are relatively drought tolerant and rarely require watering. In Autumn when they burst into life they make a great cut flower as well as a colourful garden plant. Plant the bulbs in large groups for a mass display . 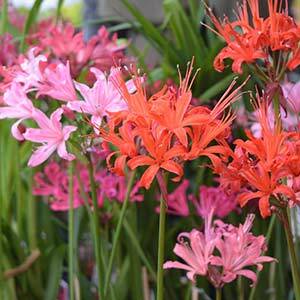 Nerines also grow well in pots and make a good floral display in a container near the door or on a patio. These are a bulb that prefers to be left undisturbed, so only divide one they have become overcrowded. Nerines are best planted with the neck of the bulb above ground level. A sunny position where they will get lots of good summer sun will ensure good flowering, bulbs planted in deep shade will rarely flower. Choose a sunny position with a well drained humus rich soil. In very hot areas, a little afternoon sun will be beneficial. Dig the soil over well before planting. Add a little well rotted compost to improve soil structure. The best time to plant Nerines is in early summer, before they begin active growth. Space bulbs at around 10cm apart. The neck of the bulb should be just above ground level. After a few years the bulbs will multiply to form a large clump. They do not need to be divided unless the quantity and quality of the flowers decreases. Different varieties flower from mid summer right through to late autumn, so a careful selection can provide wonderful flowers over a long period. N.bowdenii being late flowering, around April while N.fothergill major is an orange-red early flowering variety that can flower as early as February. Nerine flexuosa ‘Alba’ is an autumn flowering white nerine. Nerine kregii with its fascinating twisted leaves. Nerines will grow well in containers, they will need a good quality potting mix and a little extra fertiliser as soon as active growth commences and again after flowering. The only differences between growing these free flowering bulbs in pots and tubs is that they will need a little more fertiliser and some extra water. You will also need to divide them more frequently, however still only after 3 – 4 years.